For more information on liquid-level and flow sensors from Gems Sensors, call 860/747-3000. Often, OEMs must work closely with outside suppliers to effectively integrate components into a product's design. This is particularly true in the medical device industry, where designs are scrutinized to ensure safety and effectiveness and where shortening the development cycle is essential to marketing a product successfully. One company that has discovered the importance of working with suppliers early in the product design process is the diagnostics division of Abbott Laboratories. The manufacturer is developing an immunoassay analyzer that mixes chemical reagents with blood samples and performs multiple tests on more than 200 different blood specimens per hour. Light photon analysis on the blood/reagent solutions within the instrument provides physicians with vital information on a patient's condition. Carefully measured chemicals are delivered to the analyzer through a system of siphons from reservoirs at the bottom of the apparatus. Reliable delivery of the reagents during the testing process is critical. If the tanks run empty and air is siphoned into the system, not only will an expensive repriming of the chemical reagents have to be performed, but hundreds of unhappy patients will need their blood drawn for another test. On the other hand, because chemical reagents are expensive, virtually all must be emptied from each container before a new one is used. Thus, Abbott required a system that would inform the technician about how many more tests the bottles could go before needing replacement. This posed a challenge. There needed to be three bottles with three level sensors to comply with various siphoning applications. Two of the bottles are designed to be changed by the lab technicians, but the third bottle is refilled automatically from a reservoir while being monitored by a liquid-level sensor. Once Abbott's engineers had determined the analyzer's requirements, they contacted Gems Sensors (Plainville, CT), a manufacturer of liquid-level and flow sensors. After extensive research and consultation, Abbott accepted Gems Sensors' suggestion to use float-switch technology because it is considered more practical and less expensive than other technologies. The Gems product that best fit the solution was the LS-350 series of liquid-level switches. The small polysulfone-bodied switches are well suited to be used in shallow tanks and reservoirs. They use a magnet-equipped float that rises and lowers with the liquid level along the unit's stem and can have as many as four actuation levels. 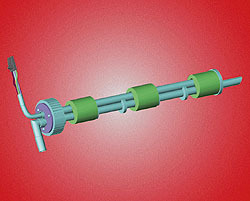 The magnetic field generated inside the float actuates a hermetically sealed, magnetic reed switch mounted in the stem. The reservoirs proposed by Abbott measured less than 18 in., just right for the LS-350 models. Although the chemical reagents in Abbott's analyzer remain at room temperature, the sensors can withstand temperatures from ­40° to 225°F and pressures up to 250 psi. Gems engineers used preliminary sketches supplied by Abbott to design a customized LS-350 for operation within the new instrument. They combined a level sensor and draw tube to siphon the reagents up into the machine. This design is easier for the operator to handle. Gems also designed a threaded bottle cap into the sensor assembly for one complete unit. The analyzer's operator needs only to unscrew the entire one-piece sensor assembly from the bottle, insert the sensor assembly down into a new bottle, and screw the top back on. Having one hole in the bottle instead of two reduces the possibility of outside contamination. The reservoir containers are made of standard clear polypropylene. Their concave bottoms typically allow fluid to accumulate around the edges of the bottle, and so, to accommodate these concave bottoms with centered tops, Gems engineers designed an angled mounting configuration to ensure less waste of the expensive fluids. Gems engineers customized the sensor to fit the individual requirements of the three reservoirs. The first two, known as Trigger 1 and Trigger 2, are 7-in. bottles outfitted with 6 1/2-in. single-point level sensor switches. As the chemical decreases in the tank and the polypropylene float reaches a preset actuation level near the bottom, an alarm sounds and a timer alerts the tester that there is a specified amount of tests remaining before the chemical level gets low enough for air to be drawn in. To ensure that an operator cannot inadvertently hook up the wrong sensor, thereby contaminating the solutions, the matching switches were made foolproof by color coding the bottle tops and outfitting one with a two-pin connector and the other with a three-pin connector. The third reservoir, which is approximately 18 in. tall, holds the buffer, an important chemical solution used in immunoassay testing to neutralize both acids and bases. The liquid-level sensor in the buffer reservoir has three separate switch actuation levels: high, low, and low-low. Unlike the first two reservoirs, this bottle is not changed by the operator. It is replenished through a tube that, along with the sensor and the siphoning device, comes through the top of the bottle from a fourth reservoir holding the buffer solution supply. When the chemical gets to the low setting, an alarm goes off to alert the operator that the refilling sequence should begin. When the sensor's float reaches the high position, an alarm tells the operator to stop. However, if the refill mode does not kick in and the chemical gets to the low-low level, the sensor signals the analyzer to shut down. The integrity of the rest of the blood samples is thereby protected. As the immunoassay analyzer was honed to meet customer needs over the past year, the design of Gems' LS-350 sensor has been modified. In addition to customizing an existing level sensor, Gems completed the assembly by incorporating a PC board with PVC cable preterminated with a connector, thereby allowing Abbott personnel simply to plug in the sensors. Gems also modified its FS-150 polypropylene flow switch to control the delivery of saline solution into the new analyzer. The company added lead wires and two-pin connectors, identical to those on the LS-350, for easy hookup during the manufacturing process. Gems will continue this evolutionary process as additional modifications are required. With the help of a supplier, Abbott engineers are succeeding in developing a well-designed, functional product.